We offer a research based, hands-on approach to differentiating language arts instruction. Here you can view and buy our products, which are an engaging supplement to your current English Language Arts program. We are used in schools across the world because we provide quality standards-based curriculum, ongoing assessment, and student activities. 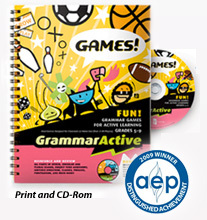 A 155 page spiral bound teacher resource book with CD-ROM is filled with over 70 action-packed learning games and over 440 large printable parts of speech and punctuation flashcards. 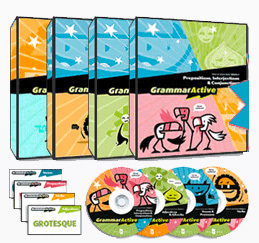 Carefully designed for intensive review and reinforcement of English grammar usage, mechanics, and structure, this teacher resource is easily used with multiple age and ability levels (from beginners to advanced). 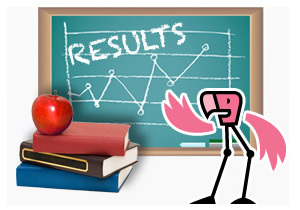 All of our lessons, games, and activities are designed for easy projection for active classroom participation. All work great with standard or interactive whiteboards. Make your classroom an interactive one by using GrammarActive today! Our digital games can be used on a single computer or an interactive whiteboard for direct instruction and competitive play. 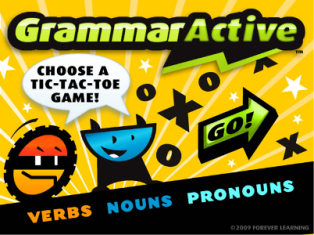 Click here to see a demonstration of GrammarActive Tic Tac Toe.